A celebrated director shares his memories from his years as the head of one of the world’s most famous theater companies. Hytner was already an accomplished figure—in the 1990s, he directed the original stage productions of Miss Saigon and The Madness of George III—when, in 2003, he became artistic director of London’s National Theatre. He left in 2015 and has now written this witty memoir, his debut book, most of it devoted to that period. “You start with a vision, and you deliver a compromise,” he writes. “And you’re pulled constantly in different directions.” Throughout, Hytner describes the many compromises (the balancing acts of the title) that he and his company of actors and writers—among his collaborators were Alan Bennett, Alex Jennings, Frances de la Tour, and Maggie Smith—had to make, one of which was figuring out what to do when government cuts to arts funding meant that “a huge potential audience…could no longer afford the arts.” In response, he innovated, pioneering the idea of corporate-sponsored, inexpensive seats and putting on a range of programming, from classics such as The Importance of Being Earnest to more challenging fare like Bennett’s The History Boys; England People Very Nice, a raucous “comic odyssey through four waves of immigration to London”; and, most notoriously, Jerry Springer: The Opera. Though the tone of the book is inconsistent, ranging from stream-of-consciousness to gossip to near-scholarly readings of Shakespeare, the many backstage stories, as well as the author’s reminiscences about his flirtation with Hollywood, make this an entertaining read. Among the anecdotes: Harold Pinter’s profane tirade at a restaurant because Hytner didn’t revive the playwright’s Celebration and the story of producer Cameron Mackintosh pushing a composer off a piano stool to show him how to perform a song only for Mackintosh to remember that he didn’t know how to play the piano. 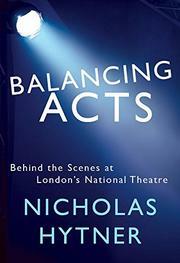 For fans of the stage, this is a pleasant peek behind the scenes during a transformative period of British theater history.